This is a great-looking party appetizer, goes great with cocktails, and is simply stunning on the holiday table. 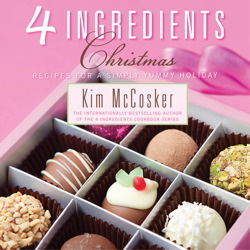 From 4 Ingredients Christmas: Recipes for a Simply Yummy Holiday. Preheat the oven to 350°F and line one or two baking sheets with parchment paper (depending on the size of the breads). Place the flatbreads on the baking sheet and sprinkle each with 1/2 cup Gorgonzola. 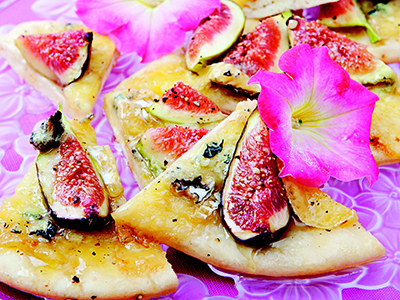 Arrange the figs on top, then drizzle with honey and season with sea salt and pepper. Bake for 15 minutes, or until golden. Once out of the oven, slice and serve immediately. Optional: Substitute an 8-ounce piece of Cambozola or Brie, rind and all, for the Gorgonzola in this recipe. Tip: Fresh figs contain up to 80 percent water, with the highest levels of natural sugars. They are a brilliant source of energy and, like blueberries, are a great stimulant for the brain.